“Tibby… proceeded into the dining room to eat Elvas plums.” Today’s connection is especially random. Here I am, in Rarotonga on actual holiday, with time for reading which I’m using to revisit Howards End, having chanced across the movie on TV recently – and what do I find in Chapter 8, but a passing reference to Elvas, an ancient walled city in Alentejo in Portugal, which I explored just a week ago, never having heard of the place before (apart from apparently reading that sentence in 1975 and, pre-Google, not being bothered enough to look it up). By the way, Forster would never have dreamed of writing such an unwieldy sentence as that, in all his life. That Elvas is known for its plums was not touched on during our visit, curiously, given the intense food-focus of the famil. We went there after yet another long, long lunch in another town, when the conversation was entirely about the dishes (“ad nauseum”, I grimly noted at the time) and trailed about the cobbles after an eager guide who was anxious that we should learn all about the town’s history of defence. 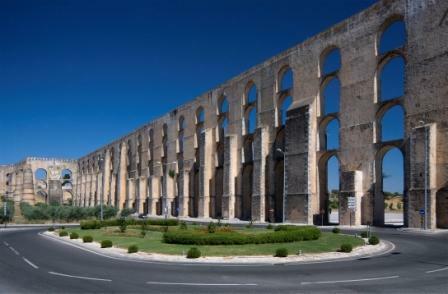 The walls are certainly striking, built in consecutive star-shaped sets, making Elvas a World Heritage site because of its fortifications: it’s only 10km from Spain, so there’s been a lot of argy-bargy here over the last couple of millennia. I’m guessing that if I ever re-entered my Bernard Cornwell Sharpe phase I’d find it featured there too. 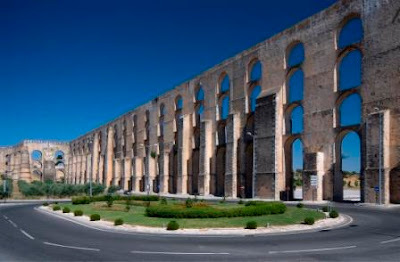 Elvas has “seven bulwarks, four half-bulwarks and a redan connected to each other with curtain walls” if you were wondering. What that means is that it’s simply spectacular from the air, where the shape of the city walls and its outlying forts are clear to see. On the ground, they’re still impressive, but even better I reckon is the Amoreira Aqueduct, which is 8km long and up to 30m high right beside the town: that’s four levels of arches in creamy limestone – beautiful and amazing, the product of 90 years’ work from 1537 – and which I didn’t get to photograph or even properly look at (we just drove past it without stopping) because of that blasted food writer getting lost at the previous town and making us late. I feel like fasting just to spite her; but instead I’ll go for the massage that the Pacific Resort people have kindly given me a voucher for, and try my damndest to stay awake this time.